2018 was a wonderful year at De Hoop, record-breaking whale numbers, fantastic guests, and the launch of The Shed - the new venue of our Fig Tree Restaurant. Couples tied the knot overlooking the vlei, families rediscovered the magic of quality time together outdoors, and athletes turned the natural surrounds into a high-performance sports ground with both mountain biking and trail running events. To celebrate the year in review, we have put together a fun infographic with some more highlights for 2018 and the festive season - enjoy! We wish you all the best for the year ahead and look forward to welcoming you to De Hoop soon! We just love #GuestFeedback and here's one of our recent favourites. "A GREAT PLACE JUST GOT BETTER. This was our third visit to De Hoop. Since our last visit 3 years ago we found that the restaurant facilities were greatly improved but with the same good standard of food and service. This added to our overall enjoyment of the reserve. We love the freedom to walk around and see the plants, birds and animals that are around. This time we saw the elusive grey rhebok. We enjoyed the early morning bird watching and the trip on the Vlei." Felicity will soothe out any aches or stresses you may have with a rejuvenating full-body massage which she offers in her peaceful tranquility room. 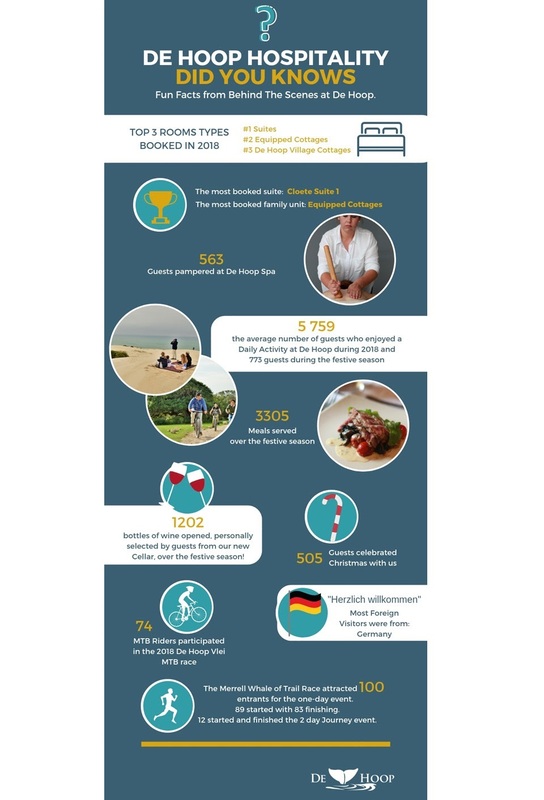 Reasons to be a member of Gansbaai Tourism? Gansbaai Tourism forms part of the Cape Whale Coast and is run by experienced staff who personally welcome you to Gansbaai. There are loads of studies that prove the important health benefits associated with exercise, and it becomes more important as we age. This treadmill lets you burn up to 30% more calories than the average motorized treadmill and is built with intense training in mind.